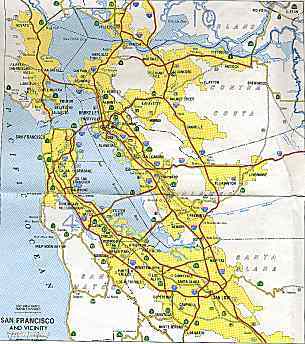 Now our attention turns to the larger San Francisco Bay area; the portion pretty much between Gilroy to the south; San Rafael to the north, and Oakland and the East Bay. Just like San Francisco, many routes were planned for this area. As with Southern California, the initial plans for freeways in this area was quite ambituous. And, as with Southern California, many of the routes that were planned never became freeways. Some exist only on paper, and some are still just everyday highways, without any control of access. Route 5. 1963 Route 5 is present-day Route 35. Route 9. Much of what the 1963 map shows as Route 9 is present-day Route 85, Route 237, and Route 238. Route 17. 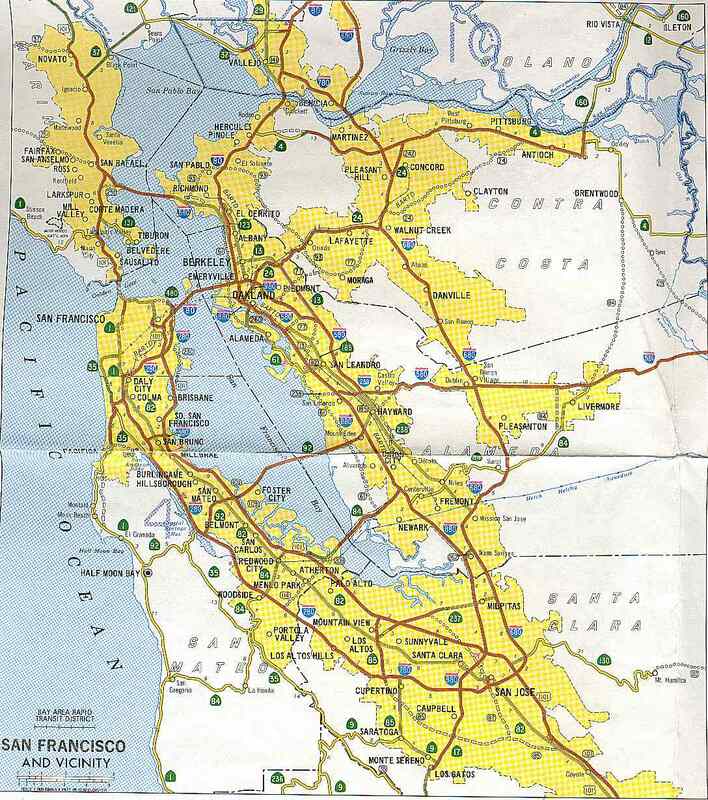 Portions of 1963 Route 17 have been renumbered into I-880 and I-580. Route 21. Much of 1963 Route 21 is present-day I-680. Route 48. 1963 Route 48 is present-day Route 37. In Part 1, we explored the routes in the city proper. 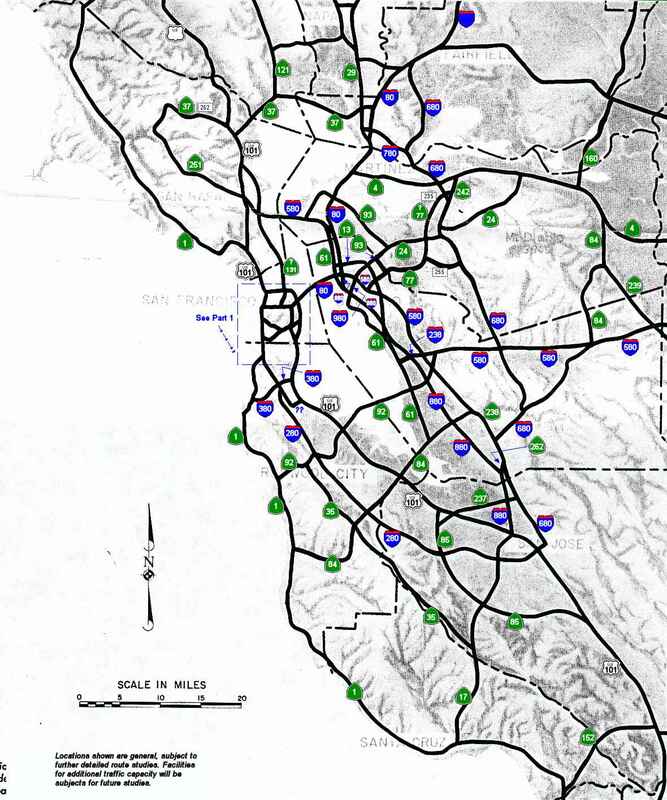 Let's now look at some of the planned freeways that didn't make it. Route are referenced by their present-day route number, if one exists. Route 1. [LRN 56] Although the route was constructed, it was planned as full controlled access freeway. 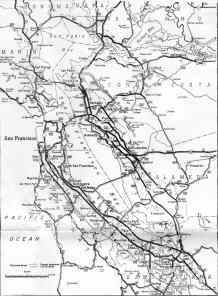 Those in the Bay Area can rest assured that this notion wasn't theirs alone; there was a similar Ocean Freeway planned for Southern California. Route 13 [LRN 206]. Through Oakland and Berkeley. Originally planned as freeway, never upgraded. Route 24. [LRN 256] Although Route 24 exists as freeway between Oakland and Walnut Creek, it was originally planned to extend from a point N of Walnut Creek to join Route 4 near Antioch. This extension is on the books only; it was never constructed. Route 29 [LRN 74] The Napa Valley Freeway. Never upgraded. Route 35. [LRN 55] A freeway across the hills. Exists as standard highway only; never upgraded. Route 37. [LRN 8, LRN 206]. Planned as freeway across the N end of the Bay. Never upgraded. Route 61. [LRN 226, LRN 257, LRN 258] A western bypass for I-880 in Oakland. Only a small portion of Route 61 was constructed, as expressway, leading to the Posey Tubes. The rest is legislative only. Route 77. [LRN 235] A connection between Pacheco, S of Pleasent Hill and Oakland. Although Route 77 was planned, it was never constructed. Reminds on a bit of Route 64 in Los Angeles. Route 84/114. [LRN 107, LRN 108] Planned as freeway between Route 1 and at least Route 4. Today, the only controlled access portion is the bridge, and much of the route only exists on the legislative books (from I-580 to Route 4). Note that LRN 107 refers to another unbuilt highway, Route 114, between Route 35 and the bridge. The current Route 84 between Route 35 and US 101 was not planned as freeway; it was LRN 214. Route 114 is still on the books between I-280 and the bridge. Route 92. [LRN 229] Planned as freeway across the hills, to join up with the current freeway portion. On the E, it would extend to I-580. Route 93. [LRN 254, LRN 255]. Another route that exists only on the books, this route, in its full glory, would have run from Richmond, north through San Pablo, and then SE through Orinda to join with Route 77. It would have left Route 77 again near Burton, and continued to Alamo (this latter segment, which corresponds to LRN 255, was deleted in 1973). Never constructed. Route 121 [LRN 8]. The Sonoma Valley Freeway. Never upgraded. Route 131. [LRN ???]. The planning map shows a second N bay crossing. This was gone by the 1963 State Highway Map, so it looks like it might have been a proposed extension to Route 131 from Tiberion to the City. Route 230. [LRN 289]. This only shows on Figure 2-1; it was gone by the time the planning map was constructed. 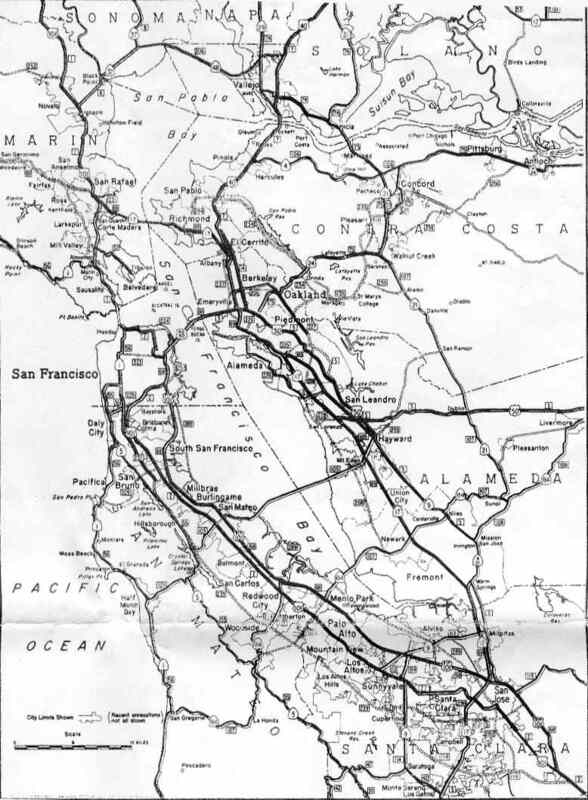 This is the proposed Route 87 (later Route 230) freeway, which would have provided an east bypass on the west side of San Francisco Bay, and a connection to the Southern Crossing. Route 237 [LRN 113]. Originally planned as freeway between Route 85 and I-680. They're working on it :-). Route 238 [LRN 5]. Originally planned as freeway from I-680 (they just demolished the interconnect) to the present freeway portion. Route 239 [LRN 110]. Planned as freeway from Route 4 in Brentwood to I-580, through Byron. Unconstructed, routing never determined. I-380. [LRN 229] The current route only runs from I-280 to the SFO Airport. Originally, this would have run all the way to Route 1. There have also been proposals to extend it across the bay from N of SFO. Route 85. [LRN 114]. Present-day Route 85 freeway. Route 87 [LRN 289, LRN 292] (between 1963 Route 9 and LRN 114). Present-day Route 87 freeway. Note that this is not on the planning map. Note that Route 87 was originally planned to go as far N as Route 237. Something closer to the present-day routings are better illustrated in this excerpt from the 1986 state highway map (Figure 2-3). Note the routes shown in open-circles, which designate routes that were never adopted. The open-dashed-lines are routes that were still planned for construction. Note that since 1986, some routes have changed even further. In particular, Route 480 in downtown San Francisco is gone, and I-880 has had significant rerouting in Oakland.